My husband doesn't like to cook. Not that he doesn't know but feels lazy! He says that he can cook only special dishes and that I shouldn't expect him to cook the usual dishes! But once in a blue moon and sometimes during weekends he gears up and cooks up few dishes of his own. He doesn't like to follow any recipe available but likes to experiment on his own. He used to always brag about a grilled fish dish that he made for his friend during his bachelor days and how his friend was taken by surprise on seeing his cooking skills..(The story goes on and on..). For me this always remained as a tale as he never made it after marriage! Whenever I asked him to make the dish he kept postponing saying that he would make it during summer. This long due promise was fulfilled last weekend. We went in search of Salmon to the grocery store but ended up in buying Orange Roughy-a deep sea fish, instead. We were seeing this fish for the first time and decided to give it a try. You may substitute this with any white fish too. This dish goes well with Persian Dill rice. Since we hadn't planned on making this dish in advance we didn't have dill rice to go with this but since I had enough dried dill we mixed it with steamed rice at the last moment. Though we couldn't recreate the taste and flavour of Persian dill rice, this was enough to satisfy our cravings. The dish is hot and spicy with a tinge of sweetness added by dried raisins and cranberries. You may adjust the spiciness to suit your taste by varying the amount of ingredients mentioned below.The addition of roasted cashew pieces imparts crunchiness to the dish. A cast iron skillet was used to make grill marks appear on the surface of the fish and to seal the outer layer of the fish so that the juices still remains inside. The vegetables are also added at this stage for a similar purpose. This whole skillet containing the vegetables and fish is then baked in an oven for some time until the fish and vegetables are cooked. This is later garnished with dried raisins, cranberries and roasted cashews. Pat dry the fish pieces with a paper towel. Marinate the fish with the ingredients mentioned under marinade. Marinate the vegetables too with left over marinade. Heat a cast iron skillet at high heat. Spray and grease the skillet with enough oil. Place the fish pieces with serving side down first on the skillet until the grill marks appear on the surface and the outer layer has sealed. Turn the other side down and add the vegetables. Drizzle more olive oil. Cook till the grill marks appear on the surface of the fish, the vegetables and until the outer layer has sealed well. Place the entire skillet in the oven and bake till done. It took about 15-20 min. Before removing the skillet from oven keep at broil mode for 1-2 minutes. If the vegetables aren't cooked completely even after the prescribed cooking time, remove the fish slices onto the serving plate, place the skillet containing the vegetables at high heat, add about 1 tbsp butter to grease the pan and to add extra flavour and cook till done. Garnish with raisins, cranberries and cashews. Serve hot with Persian Dill rice. And a Lovely Blog Award award from Hema of Salt To Taste. Thanks a lot for the award Hema. I hereby pass the award to all the blogs I love and to all those who support me and posts valuable comments and suggestions. Love all your blogs :) I sincerely hope I havent missed anyone out. 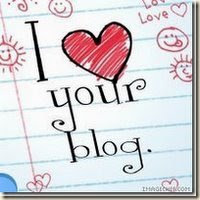 I have nominated u for the "I love your blog" award.. Healthy version to cook fish..Looking great pooja.. Thanks for the visit at my blog pooja,hope to c u more often. The grilled fish looks just too perfect! Congrats and Thank you so much for thinking about me also dear :).I am lucky to have a friend like you :). Thanks Ramya :) Yeah you are right..I too love to bully him with such stories! Thanks Suparna :) See you too. Thanks Pooja! Your hus tale seems to be an exact copy of mine too.. :) I love the way he grills fish or chicken.. this looks delicious! This fish looks so delicious! Thanks for the award pooja..
fish looks very tempting pooja!! Thank you Pooja for the award. This would be my first one.I'll forward the award to other bloggers in my next post.